All of our FilterFlow automatic water boilers come with built-in water filtration and intelligent eco settings to save energy. Available in twin tap (ideal for busier periods), twin tank (enabling dual pouring), as well as hot and cold units (filtered chilled and hot water on tap. 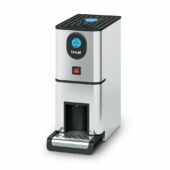 Space saving and economic) — there's sure to be a FilterFlow unit perfect for your every need. Easily operable thanks to a large colour touchscreen display, each of these units is simple to use, cheap to run and easy to maintain. 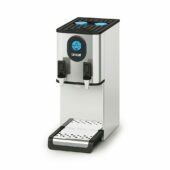 Their narrow 250mm footprint saves valuable counter top space, without compromising on capacity or performance. 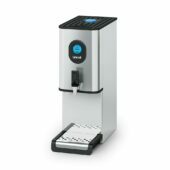 The built-in eco setting reduce the volume of boiling water by 50% for quieter periods, while the intelligent predictive eco setting learns your usage patterns, automatically adjusting water volume to deliver the required amount in the most economical way. A 7-day timer programme switches off the unit overnight, or at weekends to conserve energy. Should a problem ever arise the enhanced on screen diagnostic information will enable an engineer to identify the parts needed in order to repair your water boiler in the first visit.